The USI said Joe O’Connor has firsthand experience with the college grant system which will help him represent struggling students. 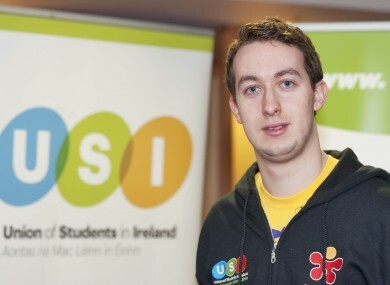 THE UNION OF Students in Ireland (USI) has today elected Roscommon native Joe O’Connor as its new president for 2013/2014 at its annual congress. O’Connor has served as the president of the GMIT Student’s Union for two years before this and was also previously the Vice President for Welfare. The USI said today that O’Connor, who has an honours degree in Accounting and a Masters in Strategy and Innovation Management has personal experience of coping with the increasing cost of third level education, having relied upon the maintenance grant throughout his time in college. Speaking today, O’Connor said the the need for “effective national representation is more acute than ever” as families struggle with increasing fees and “dwindling student supports”. “At this time, 10,000 vulnerable students are still waiting on their first maintenance grant payment from SUSI and countless secondary school students wonder if they can afford to attain what should be their right; an education that best equips them to play their part in our country’s recovery,” he said. UCD’s Paddy Guiney was elected to the position of Vice President for Campaigns. Guiney has stated that re-affiliating UCD is one of his top priorities. Email “Roscommon native elected as new USI President”. Feedback on “Roscommon native elected as new USI President”.